Posted byJoelRieves	 January 29, 2016 Leave a comment on Christians for Trump 2016! I don’t know about anyone else, but I have been so underwhelmed by the choices in the upcoming presidential election. Until recently, I floundered around, looking for the true, evangelical Christian candidate, all to no avail. Ben Carson was looking good for a while, but then I realized he’s a Seventh-Day Adventist, and I just can’t hang with a such weird, semi-magical faith. Jeb Bush is a Catholic and, as we all know, the Pope is the Anti-Christ. So, he’s out. I had all but settled on Ted Cruz as the one, but I just wasn’t feeling it. I thought all was lost until, just a few days ago, the clouds parted, the trumpets sounded and the answer I was looking for was revealed. You see, that’s when Jerry Falwell, Jr, president of Liberty University and son of Rev. Jerry Falwell, endorsed Donald J. Trump for President of the United States, calling Trump “a successful executive and entrepreneur, a wonderful father and a man who I believe can lead our country to greatness again.” Yes! 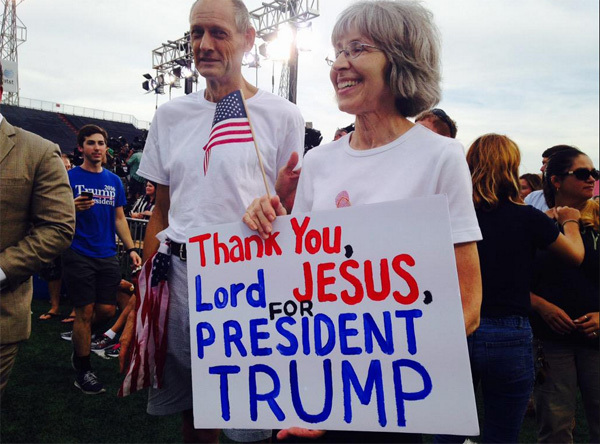 Coming on the heels of Sister Sarah Palin’s declaration of support , it is clear that God wants Donald Trump to lead this country back to greatness. Of course, some wag is going to point to the Donald’s less-than-stellar knowledgee of the Bible or the fact that he can’t remember ever asking God’s forgiveness, questioning his evangelical bonfides. But, honestly, none of that really matters. What does matter? That Trump is the only person who can save us from the dreadful mismanagement that has characterized the Obama administration. I mean, seriously, how much more employment, peace and economic prosperity can this country take? Mr. Trump is also the strong man we need to lead us against the forces that threaten to destroy the very fabric of our nation. Who else but Trump can go toe-to-toe with ISIS, Vladimir Putin and China? Sure, he backed out of the debate last night rather than face Megyn Kelly. But, after the way she went after him last time, who could blame him? Intelligent women who won’t put up with your crap are scary. Does it matter that he’s greedy, privileged, willing to use all the resources at his disposal to stroke his own ego while others suffer (often on account of what he’s said), and cares nothing for the consequences of his words and actions so long as they don’t affect him personally? Of course not! 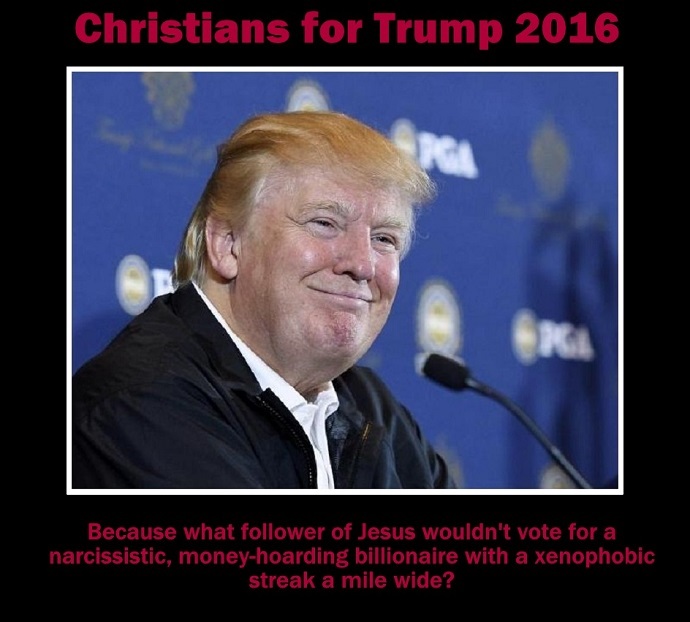 All good Christians should aspire to be like Mr. Trump; rich as Croesus and unashamedly politically incorrect. Because, really, isn’t that what the Gospel is all about?